If you're decorating a home, it’s important to choose the correct color tone for that room. When choosing Feng Shui bedroom colors for your master bedroom, guest room or child’s room, you will want a color that fits the vibe of that particular room. If you know how colors affect the atmosphere of a room, it is fairly easy to do. In this article, we will go over what Feng Shui bedroom colors would be best to implement in one’s bedroom and why. 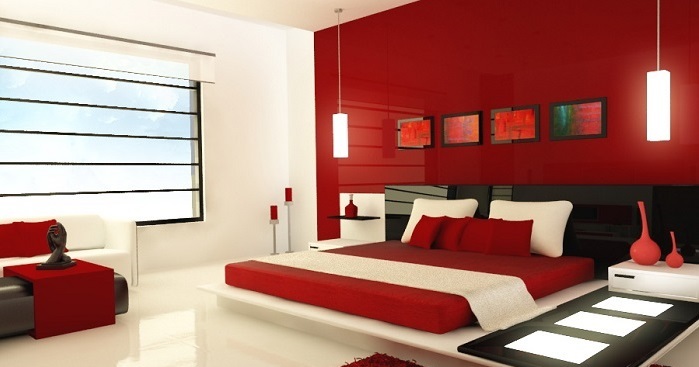 What's more, we will cover how Feng Shui bedroom colors can make a room appear brighter and larger than it really is. Choosing the right colors for the master bedroom will depend on what powerful emotion you wish to bring out. Feng Shui bedroom colors should be designed to bring out warmth, excitement, passion, enlightenment, uplifting, powerful, and desire. Red and White are the best colors to implement in this décor. 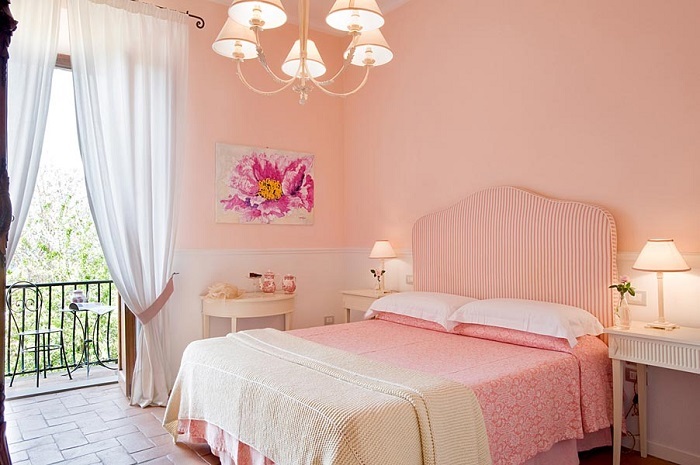 Alternatively, another Feng Shui color for bedroom romance is pink. To put this into practice, place white paint on your walls and ceiling for the warmth and to trick the eye into believing it’s a larger room. Then, use the color red for throw pillows, curtains, or comforter to accessorize your room to give it the ultimate romantic place in the house. Other accessories that fits the décor. When choosing paint colors for the guest bedroom, you will want it to be colorful yet roomy. The best Feng Shui colors for bedroom guest should have them feeling calm, pure, relaxed, peaceful, and comfortable. Lave​​​​nder and White are the best colors to use for this décor. To put this décor into action, you will want to be sure to paint your walls and ceiling white, because it will give them a warm feeling and look brighter. Next, you will want to place accessories around that have lavender in it such as pictures, pillows, curtains, comforter, or artificial flowers. If you decide to place more accessories in your room then was mentioned, be sure that it’s the best Feng Shui bedroom colors for your décor. Other accessories with lavender in them that you would like to place in your guest room. Painting supplies such as paint brush, paint roller and pan, drop cloth, and paint. It is important to know the size of your room before picking out bedroom furniture. If you choose furniture that is larger than your room can handle, your room will look small and crowded. It is best to choose a few mandatory pieces like a bed, dresser, and possible a night stand that fit the size of your room. If you want a television in your room, consider mounting it on the wall. Furthermore, to keep the room from looking overcrowded, use lighter wood to blend in with your Feng Shui bedroom colors. Another decorative thought that would go great with your bedroom Feng Shui colors is a round rug that would give an infinity look. Mainly to bring this room to the reality, you will need to know the measurements of the room by using a tape measure. Then, look at the size of furniture think of a way you plan to place it within your room. Next, imagine it in your room and write a small plan on paper to see if it will fit in your room comfortable without overcrowding. If it seems to fit and is the best color for bedroom Feng Shui, purchase it and place it in your room. When decorating a wall in a room, you shouldn’t overcrowd it with pictures and décor. In fact, it is better to leave approximately half of the wall bare with proper spacing between your pictures or décor. One can easily accomplish this by placing your items on the wall in an even pattern or steps. When placing your items on the wall, you should place them at eye level. Don’t place large pictures on small walls because it will look overcrowded and not look very appealing. To keep your picture frames from clashing with Feng Shui bedroom colors, you will want a dark frame for lighter walls. But, for Feng Shui bedroom colors that are dark, you will want the frame to be much lighter. To implement this, you first need to measure the size of your wall and write it down. Second, lay all your pictures and décor on the floor and rearrange them until you come up with a pattern you like best. Then measure how far apart they are and write it down; afterward, double check that they will fit your wall in the pattern you chose. Next, start placing them on the wall within their proper measurements. It can be challenging to draw people away from how small your room is. Creating a focal point is easy to do just place an exotic piece or picture where you want people to focus. Thus, drawing attention away from how small your room is. Simply choose a picture that draws people to be in awe. Then, place it above your bed or another section you wish to draw attention. This Feng Shui colors bedroom décor is beneficial for those that are wanting to enhance their home to live in or sell to another buyer. In this article, you have learned how Feng Shui bedroom colors can make a room have a different and exciting look. It also was discussed that you need to choose the best colors for bedroom Feng Shui that goes with your décor. Feel free to express your thoughts on this article. Also, feel free to comment on any Feng Shui bedroom color décor that has enhanced your home.